Bea - I’m really in love with all of them, but specially with beach beauty! sandra - I added the Ballerina Rag Doll to my Etsy Favs and Faved the shop. Jeffrey - And favorited. I’m not sure how to show you this though…ah! There we go! Alma Albarran - Hipster Girl is the one I would choose! Chelsea - These are beyond adorable! I would truly be happy with any-but love love love the hipster girl, geek boy, swimming sarah, peaceful patsy…heck, I love them all! erinn t || fancy napkin - Fav on Etsy! erinn t || fancy napkin - and pinned!! rebecca - Love the hipster with the hair clip- My little one has hair clips put back in all day! But the ballerina and swimmer are super cute too! 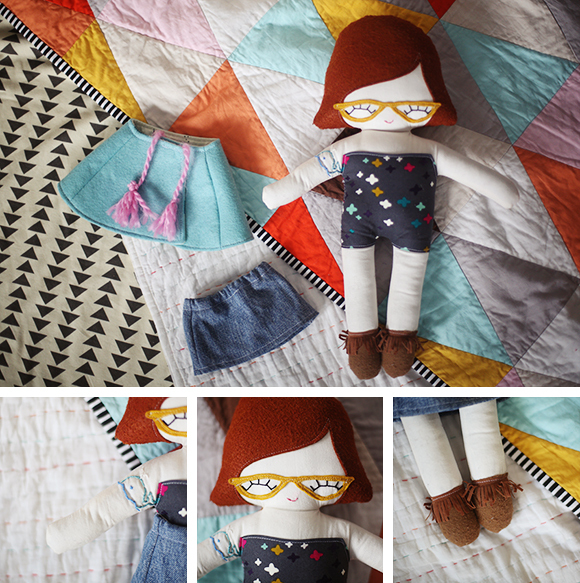 Christine - awww, I love how lila’s little glasses wearing doll turned out!! Kristine - Pinned it too! Alison R - Pinned a doll to Pinterest. Alison R - Added a doll to my etsy favorites.